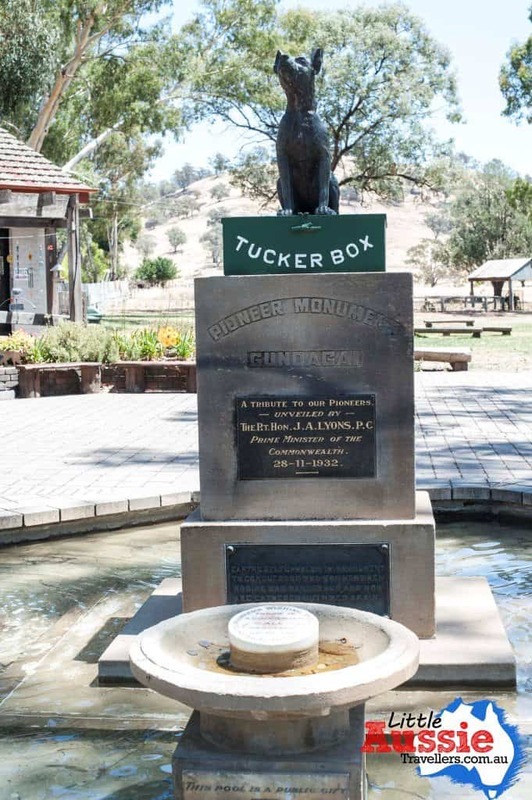 When we saw that Gundagai was up ahead, on our travels between Sydney and Melbourne along the Hume Highway, it just wasn’t an option to drive past without a stop in at the “Dog on the Tuckerbox” statue. 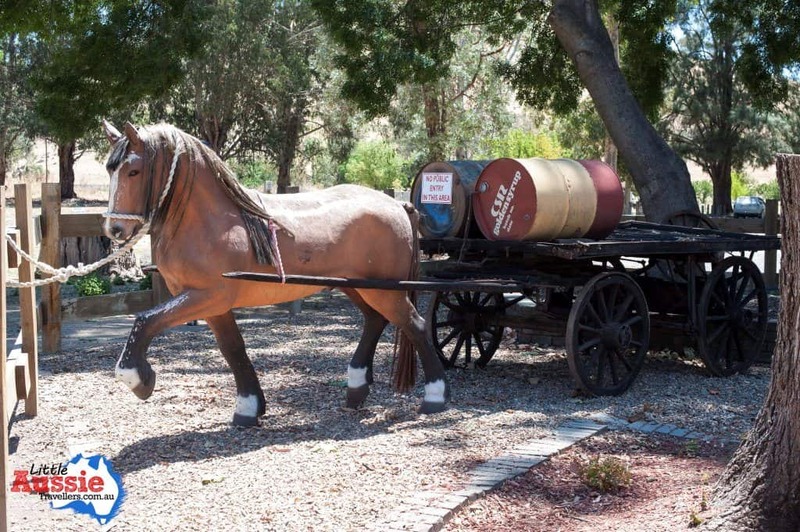 The statue is at Snake Gully, which is around 8 kilometres (or 5 miles of course) from the township of Gundagai. 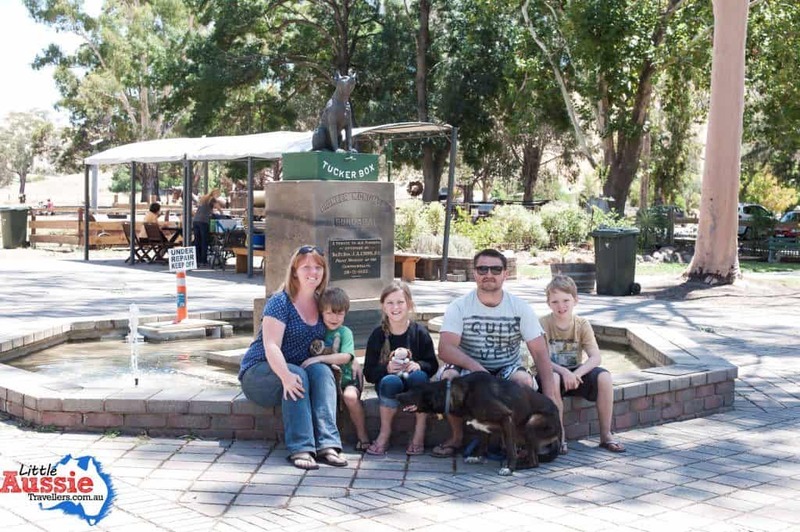 The strange thing was, that I was the one who was excited, and in my excitement soon realised that the kids had absolutely no idea “what” the Dog on the Tuckerbox statue was, and why it was of any significance! Perhaps that was a parenting failure on my part, or a sign of the times, I’m not sure, but a quick google search quickly had me streaming song renditions on the car stereo for them to hear the musical brilliance crafted in honour of this true blue Aussie icon. Jackson set to reading the dog on the tuckerbox poem, to help make some sense of what the fuss was about. I took a closer shot, hopefully you can read this old version of the poem from the photo. 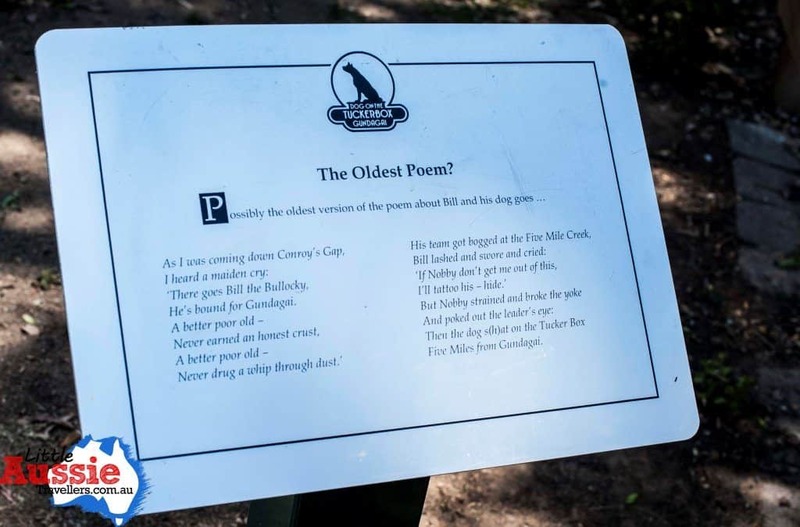 The dog on the tuckerbox was unveiled in 1932, as a tribute to Australia’s pioneers and an old poem originally penned under the name ‘Bowyang Yorke’. The poem was later modified and promoted by Jack Moses, seeking much popularity around the country. 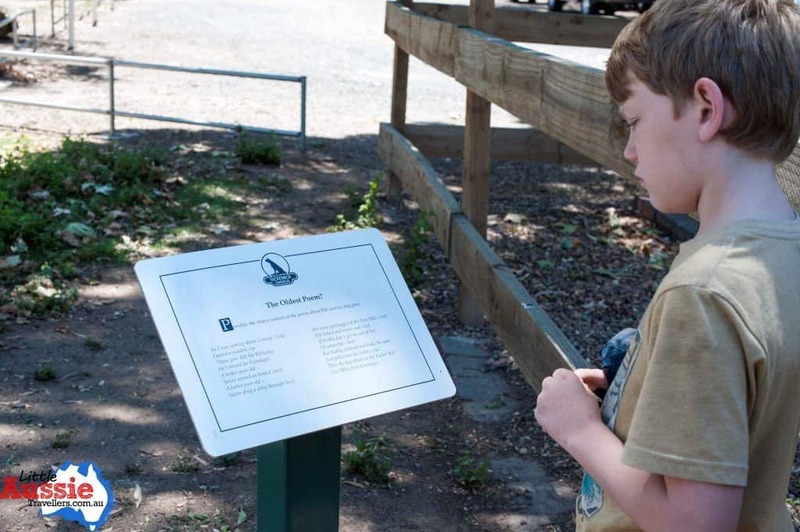 The story of the poem is based on the life of the bullocky drivers who would sometimes need to leave their bullocks when they got bogged in a creek in the area. 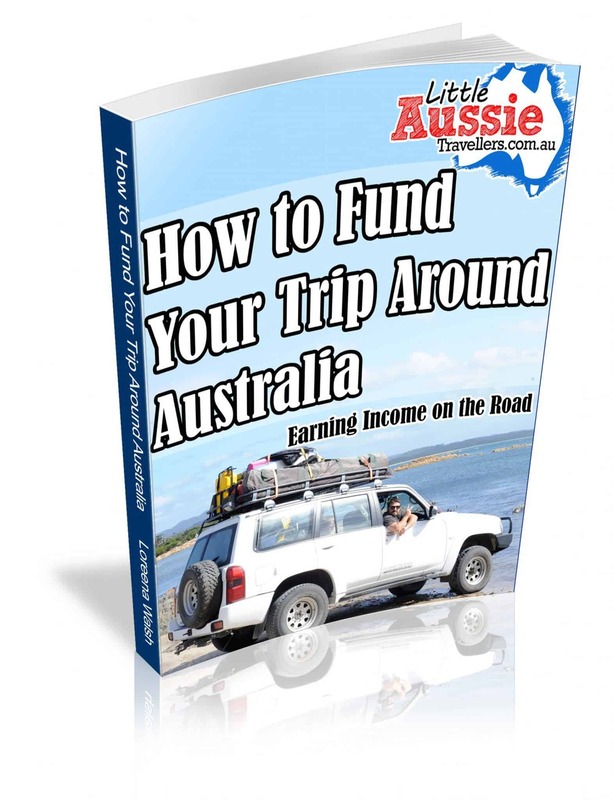 They would then seek help, and you guessed it, leave their dog to guard their tuckerbox. What Is Available At The Dog On The Tuckerbox Centre? The centre has lovely open spaces to sit down and take in the area, if you have a dog, they are allowed on leash to stretch their legs too. There’s a cafe on site, we grabbed something to eat here, but the options were pretty limited and not really great choices for budget conscious families so had we known there was a bigger service centre just down the road, we probably would have gone there instead, although Matt really enjoyed his hamburger. It’s definitely worth a stop in, you can throw a coin in and make a wish, I believe the funds go toward supporting the local hospital which is a great cause. The best thing is that you get to say you’ve made a visit to an Aussie Icon, and if you’re children are as clueless about this part of our history as mine were, then it’s a great time to educate them. I have such fond memories of singing the song as a child, so I’m still overjoyed at getting to see the memorial in real life. Can’t wait till we get to see it! Might have to prep our kids first too, not sure they’ve ever heard the song.